Sure! The unexpected shooting of a TV episode for Fashion One Television, in English, over the course of two days. A 22 minute episode on Parisian style, of which I am apparently an ambassador (says the producer herself) (like many others, I say myself). The goal was to articulate the show around two moments: making over a young woman who wanted to look more Parisian and exploring the Galeries Lafayette in order to visit the two shops I love most for the know-how and craftsmanship, Bvlgari and Fendi. The only issue? When you’re asked to speak English spontaneously in rather fractioned periods of time (the opposite of a spontaneous set-up), the result is… instructive. The only thing I could see during the shooting was my brain struggling to find the right words and concepts, producing nothing but a desert of nothingness and the practically humorous repetition of the same word: “amazing”. In a nutshell, the result wasn’t glorious on my part but as they say, you only pay the price for the first couple of times. It took me quite a while to tame my image in pictures so it’s only logical that it will take a few shots before taming my moving image, especially with sound (God, hearing your own voice is one of the most jarring experiences, isn’t it?). Anyway, as the dear teen would say. Anything else that was funny, surprising, crazy? Well yes, a photoshoot with bees, which isn’t your everyday activity, if I say so myself (and I think you’ll agree). The event took place on the roof of the Paris Mint (Monnaie de Paris). I’ve never been afraid of bees (or wasps, or any other flying insect) but I must admit I was very impressed by their calm aura. They stayed on the frame even as it was being taken out of their hive. To sum it up: I met a TV producer, bees, and a dreamy beekeeper. 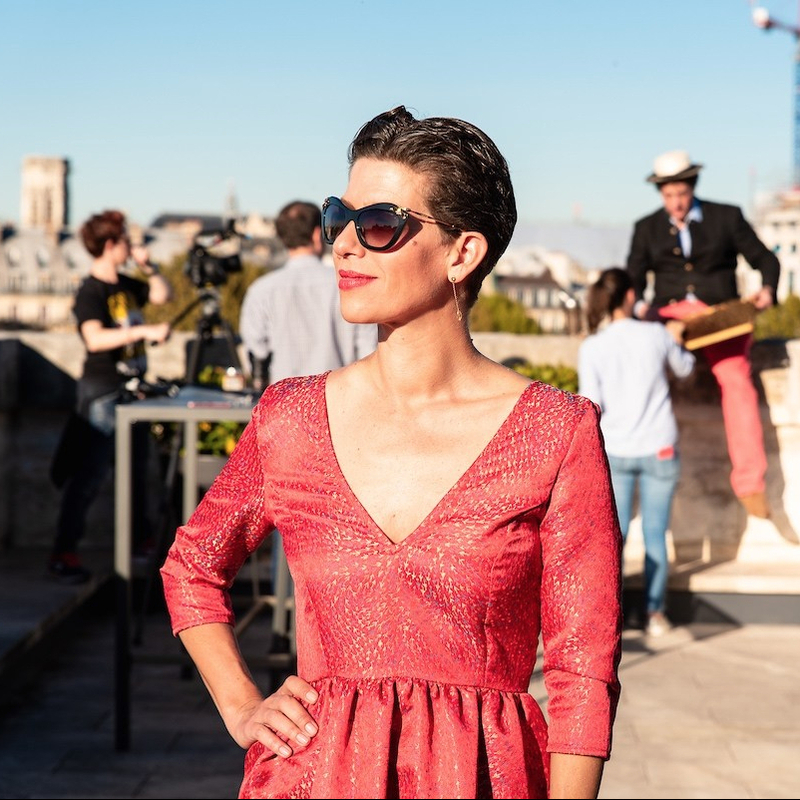 I lazed around the sloping rooves of the Paris Mint, shot an episode in the Galeries Lafayette, and during these wonderful, new experiences I was grateful for my luck, didn’t take myself too seriously and messed around a lot (as per usual – proof in the photos).